James Cagney didn’t always play the tough gangster. In fact, in 1941’s The Strawberry Blonde, he plays something very different: a dental student. Though he’s still a bit of a tough guy, Cagney’s character of Biff is no hardened criminal. He’s a lovestruck man, having falling for the new girl in town. She’s a strawberry blonde named Virginia Brush (Rita Hayworth), and Biff isn’t the only guy whose attention she’s caught. Biff’s somewhat-friend Hugo (Jack Carson) has also fallen for her, and she seems to be taking more of a liking to Hugo than Biff. On top of that, Biff gets caught up with Virginia’s best friend Amy, who takes a liking to him (Olivia de Havilland). This is an interesting role for Cagney, who is most remembered for his crime dramas. Funnily enough, The Strawberry Blonde is directed by Raoul Walsh, another man known for his tougher films such as High Sierra, Gun Fury and White Heat (which also stars Cagney). 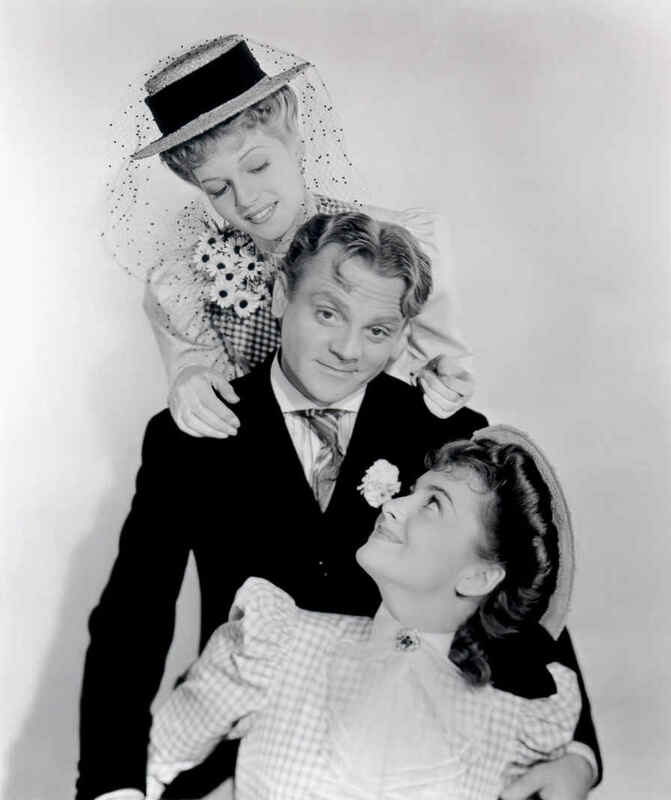 The difference of this role from his usual fare doesn’t hamper Cagney’s talents at all. He gives a very solid performance as the brash, jealous and brutally honest Biff. 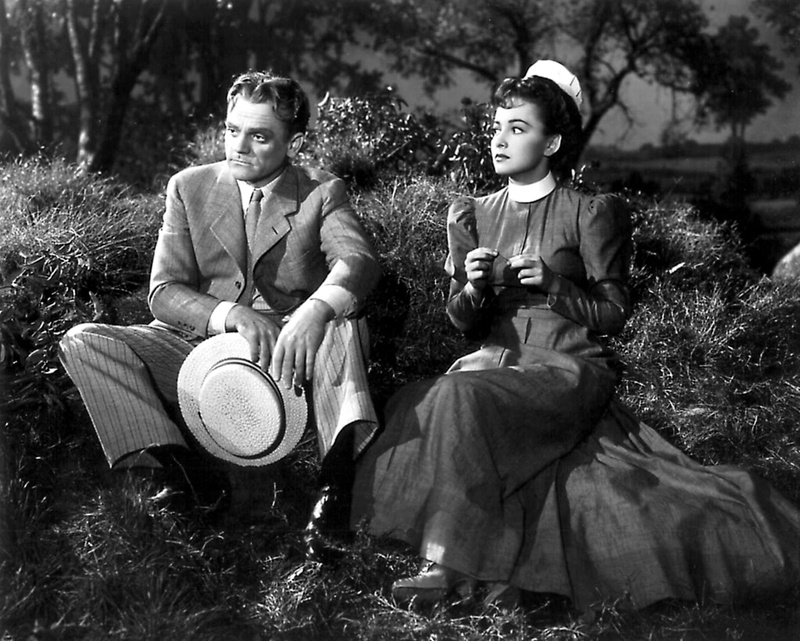 Though he softens up somewhat by the end of the film, Cagney’s convincing performance makes it a bit difficult to see why Amy would be attracted to Biff at all, with all of the head-butting and arguing that the two endure early on in their relationship. The real star here, though, is Olivia in the role of Amy. Amy is a bit of an odd character. She’s forward not only in her suffragette beliefs but also in the way that she approaches people, Biff included. He seems a bit baffled by her behavior, and the interactions between the two in their first scenes together are hilarious as a result. Her character regresses a bit throughout the film, becoming more focused on her relationship, but her spark comes back by the end. She remains the character that the viewer is rooting for throughout the film. The interaction between Amy and Virginia is also fun to watch. Their characters seem very different. Virginia is generally focused on men, while Amy is preoccupied by bigger issues until she falls under the spell of Biff. Hayworth and de Havilland play well off of each other in these roles, though Hayworth doesn’t shine as much in this film as she usually does. She often steals the show in her films, but that doesn’t happen here. The film as a whole holds many laughs and a number of surprising plot elements. The pace picks up as the film progresses and the mood becomes much more emotional, so the action only gets better as it moves along. The script is very witty, making The Strawberry Blonde a very good romantic comedy with a bit of a dramatic bite near the end. 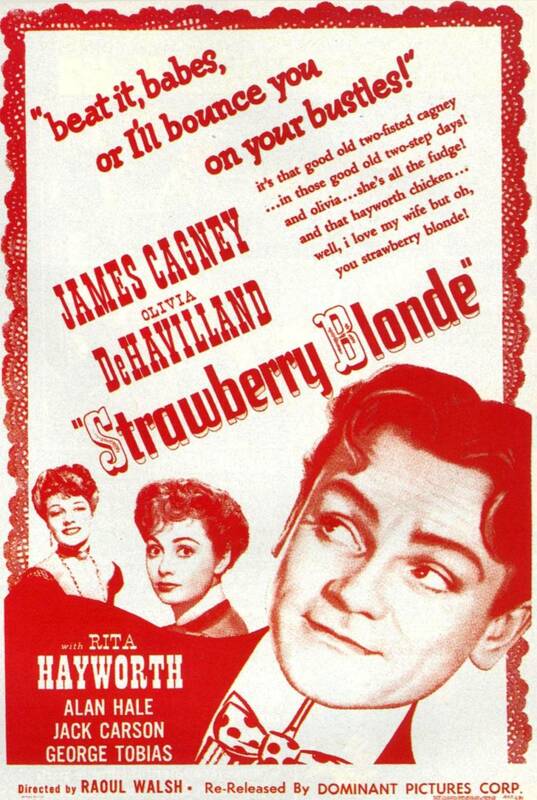 As a big fan of Cagney and de Havilland, I love The Strawberry Blonde! I definitely agree that Amy is the most interesting character here. Did you know that Olivia read this script on her own and specifically requested the part? It came at the time when she was unhappy with the roles Warner Bros. was assigning her. I didn’t know that! Great call on her part, it’s a fantastic role for her. The most touching part of this film is when Biff returns from jail and meets Amy in the park. I have seen every one of Cagney’s movies and this one ranks very high on my list. The only two that are on par with this one IMO are Angels With Dirty Faces and Yankee Doodle Dandy.